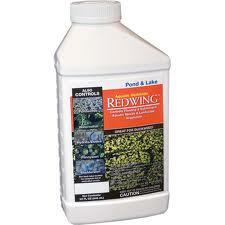 RedWing™ (active ingredient diquat) is the broadest-spectrum aquatic herbicide available. Labeled for both aquatic and landscape weeds, it effectively delivers non-selective, post-emergence control of floating, submersed and shoreline aquatic weeds, plus many grassy and broadleaf weeds in nearby landscapes. Restrictions: Livestock consumption - 1 day, Irrigation of food crops - 5 days, Irrigation of turf and non-food crops - 3 days, Human Drinking - 3 days. Emergent Weeds (Most of the plant is above water or on shoreline): Mix 1.5 oz of RedWing + 4 oz of Cide-Kick with 2 gallons of water. Mix in a tank sprayer. Spray to completely wet leaf surface. Submerged Weeds (Underwater): 1-2 quarts of RedWing per 1/4 surface acre (10,890 sqft) + 1-2 oz Cide-Kick per gallon of spry solution. Mix in a tank sprayer. 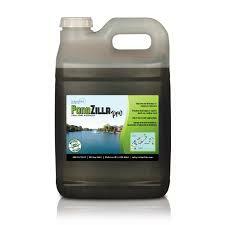 Apply as concentrate or dilute with water. Spray on water's surface where submerged weeds are growing.